Vintage Table Lamps display beauty elegance and style with an en-grained character of times past. Homeowners all over the world welcome the atmosphere that only true vintage table lamps can add to their vintage style homes. With their exquisite beauty and elegance, a vintage table lamp can also be considered as a decorative furniture accessory. They can be placed on coffee tables, desks, counters, nightstands and dressers. They can either accentuate the vintage furniture they stand on or the whole room itself. Table lamps come in lots of styles today, but the vintage lamps and their modern replicas are among the most popular choices in lamp style today. In vintage lighting, the most renowned lamp designer would be Louis Comfort Tiffany. In fact, the most sought after lamps by collectors and lamp aficionados are those designed by Louis Tiffany, especially the stained glass vintage table lamps produced during the Nouveau Art era. Tiffany produced a large number of well-received lamp designs, that even today almost any stained glass lamp is referred to as Tiffany; although to be correct about it some of these lamps are just copies of the original Tiffany styles. Nevertheless, this just goes to prove that Tiffany’s influence is very extensive. 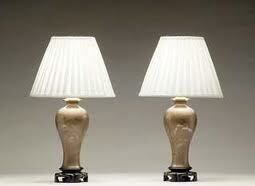 Another vintage style that offers the same class as Tiffany’s is the Victorian style vintage table lamps. Victorian style lamp shades can be traced back to the late 1700s when gas was first harnessed for its ability to steadily and continuously power a light source. The Victorian-style table lamp shades are usually adorned with tassels, tulles, and brocaded fabrics and heavy velvets in rich, vibrant colors like red, purple, mauve, plum or lilac. These silky fringed shades are very romantic and they follow the shapes of parasols, canopies, and hats—symbols of elegance and style of the Victorian era. Much later, the designs of Victorian-style vintage table lamps begin to feature skeins of beads and satin chording. Other vintage styles table lamps worth mentioning are the lovely crystal bases and the simple yet elegant shades of the Art Deco Era. Contemporary table lamps, on the other hand, feature classic designs but they also employ abstract and geometric shapes in their creations. Classic styles of modern lamps include simple blocks or pedestal bases that are topped by cylinder-shaped shades that are usually one-color. 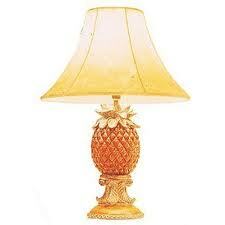 Many other styles of table lamps are readily available on the market and lighting centers. Desk lamps, which are also considered as table lamps, are easily obtainable furniture pieces; but the main purpose of desk lamps, however, is to provide light directly to the desk, not throughout the room—so we can say that desk lamps serves a more functional purpose. On the other hand, a vintage piece like a nice wrought iron table lamp would not only serve as a decorative furniture accessory but also provide enough light that spreads dramatically throughout your room. So, if you are looking for decorative lighting, why not consider vintage table lamps to bring out the beauty and elegance of that special room in your home? Send out good vibes with this LAVA® brand accent lamp. The retro design has yellow lava in blue liquid with brushed silver metallic base. 8 ounce size. Stands 10" high. 3 1/4" in diameter. A vintage feel frosted glass base with brass plated burner and flare top chimney gives an elegant glow.